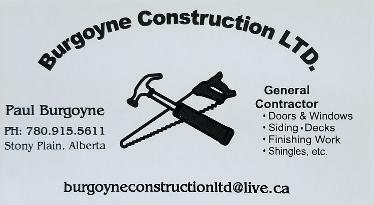 Burgoyne Construction Ltd. | Handyman Services for Parkland County. Handyman & Construction Services for Parkland County. Burgoyne Construction Ltd. provides reliable and professional handyman services and for the Parkland county and surrounding areas. We can help you from small projects to much larger home renovations. We are in the Edmonton and surrounding areas, including Spruce Grove, Stony Plain, Parkland County. Some other areas that we have gone to include Whitecourt, Mayerthorpe, Devon , St. Albert, Mundare, and Drayton Valley. Siding Contractor and installer of Vinyl siding, Cedar Siding, Hardie Board Siding Repair and other Wood Siding. Roofing Contractor, Roof Shingling and Repairs. Cork Flooring, Laminate and Hardwood Flooring, Ceramic Tile Repairs . Drywall repair and touch up painting. Door & window repair & adjustments. Interior doors & closet doors repairs and installs. Purchased products assembled & installed. Baseboard, casing & trim repairs and installation. Picnic Table Repairs & rebuilds.